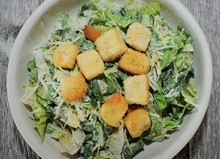 Romaine lettuce tossed in our housemade Caesar dressing with croutons and fresh Parmesan. 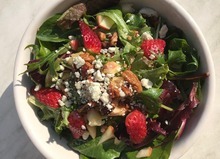 Spring mix and chopped red onion, celery and apples tossed in a balsamic vinaigrette and topped with sliced strawberries, candied pecans and crumbled bleu cheese. 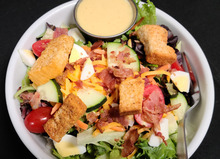 A bed of salad greens and carrot sticks topped with eggs, cucumbers, roma tomatoes, cheddar cheese and seasoned croutons. Served with your choice of dressing.